Some colonial cities prosper with independence: Singapore is the obvious case. 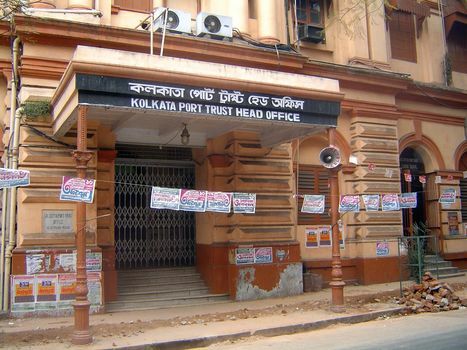 Others go into a tailspin, and here a leading contender is Calcutta--now called, as though a name change would help, Kolkata. 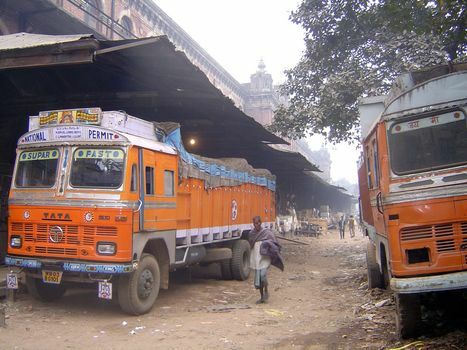 The partition of India in 1947 flooded the city with penniless refugees from what is now Bangladesh, and a long-serving Communist state government didn't help, but Calcutta's problems go back to the 1911 British decision to move their imperial capital to Delhi. 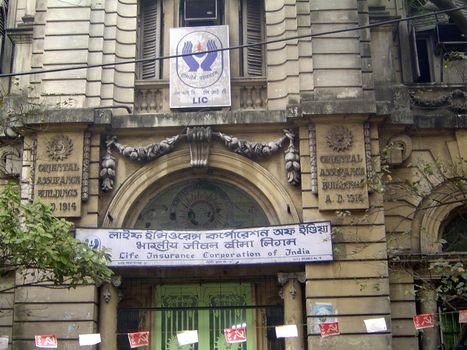 The Calcutta Corporation protested; theirs, after all, was famously called the Second City of the British Empire. 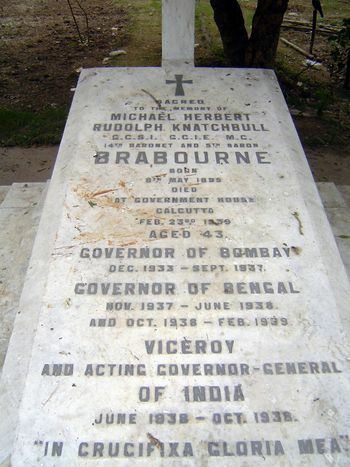 King George V offered words of solace: Calcutta, he said, "must always remain the premier city of India." Mollifying words, but false. 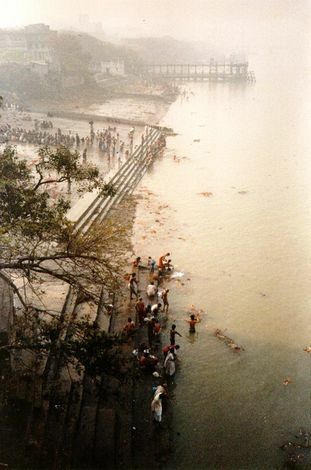 We begin with a walking tour of the old British downtown, prefaced by this Styx-like view of the Hooghly, the Ganges distributary on whose left bank Calcutta lies. To keep firm hold on the country, the British built a mighty fort here--Fort William, still in use. North of it they would build a Government House, and from there a compact government and business neighborhood grew north with buildings of grand proportions, especially during Victoria's long reign. As for the Hooghly itself, here is what Murray's Handbook of the Bengal Presidency (1882) says: "...the Calcutta Pilots... may fairly be said to be the best in the world. They are better paid, better educated, and occupy a higher position than any other pilots, and it is quite right that they should do so, for the Hugli is a most dangerous and difficult river.... New shoals are continually forming, and nothing but a daily experience of the river can enable a pilot to take a vessel up safely.... 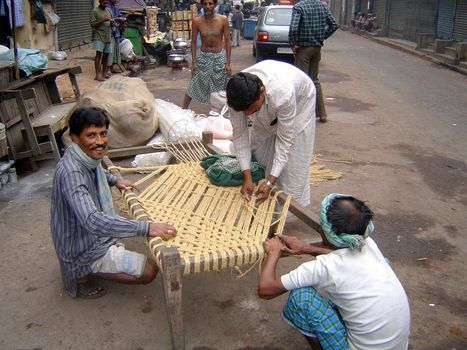 The Hugli cannot be navigated at night...."
Step out on the street early in the morning. Blink in the gritty haze. The wrought-iron columns are handsome, though. Fort William is surrounded, for defensive purposes, by a wide parade ground, the maidan. 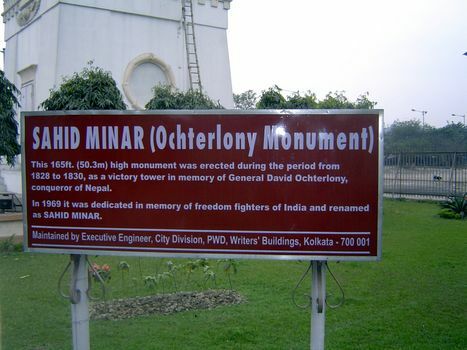 At its northern edge is the Ochterlony Monument of 1828, built to commemorate the Nepal War of 1814-16. How support a 165-foot tower built on riverside sediment? Eighty-two sal logs were sunk as piles. Over them the builders put a teak frame. Then the masonry began. There are 218 steps to the top, but the thing's locked tight. 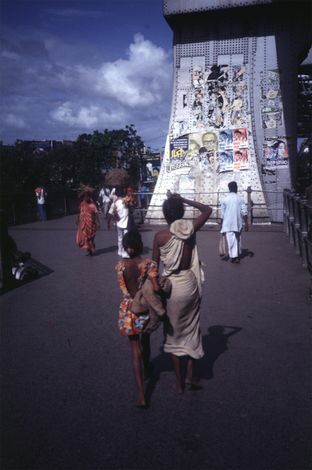 Pity: Thacker's Guide to Calcutta (1906) says that "in the hottest of our sultry mornings you have a delightfully fanning breeze on the top of the monument which rewards you for the trouble of the ascent" (p. 61). 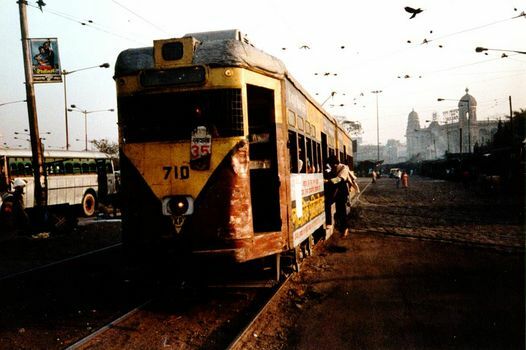 A maintenance car on the city's antiquated tramline. 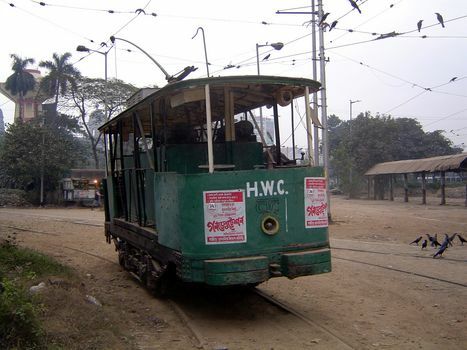 Under the white letters (for Howrah Works Car) you can make out the old logo for Calcutta Tramways Company, operating electrified cars since 1902 and now operating the only streetcars in India. 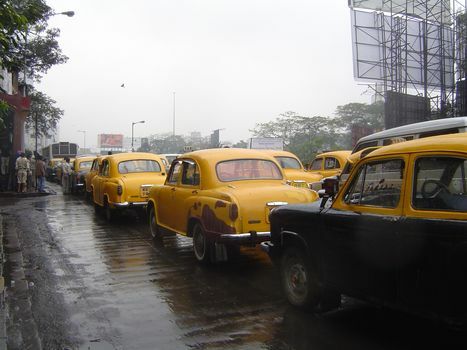 Just in case you think these pictures are biased against Calcutta, here's an illustration of the city's entrance into the modern world. 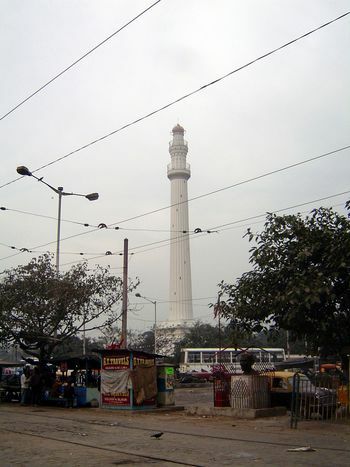 It was taken just across the street from the Sahid Minar. And now, toward the river, a side entrance to Government House, seen in the distance. 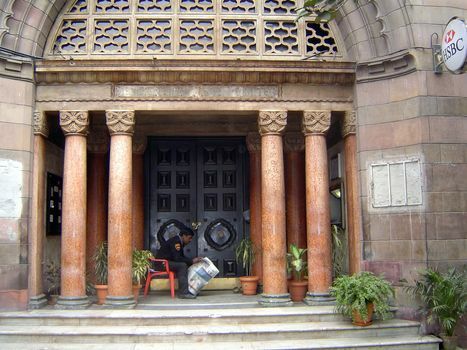 The north entrance. 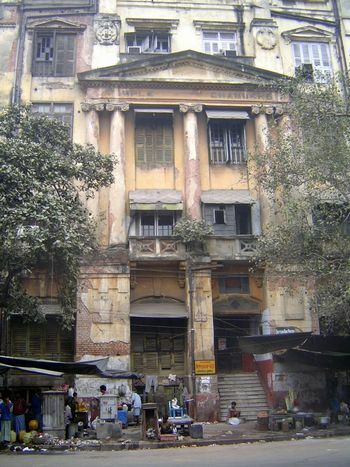 Until the move to Delhi, this was the Viceroy's palace; since then, it's been the residence of the governor of West Bengal. Begun about 1800 by the Marquess of Wellesley, it cost so much that the directors of the East India Company angrily recalled him in 1805, dismissed him as governor-general, and sued him for unauthorized extravagance. A century later, George Curzon moved in. He must have felt right at home, because the building by remarkable coincidence was largely copied by Charles Wyatt from the design made earlier by Robert Adam for Curzon's private home, Kedleston Hall, near Coventry. Kedleston was built of sandstone; this near-copy, of plastered brick. It wasn't cozy: viceroys and their wives deplored the vast spaces and the mice. The emblem in the pediment is a post-independence replacement of the Royal Arms with the Ashoka lion capital; at the base of the ceremonial stairs is a Chinese cannon placed by Lord Ellenboroughay in the 1840s. What a difference a decade makes. 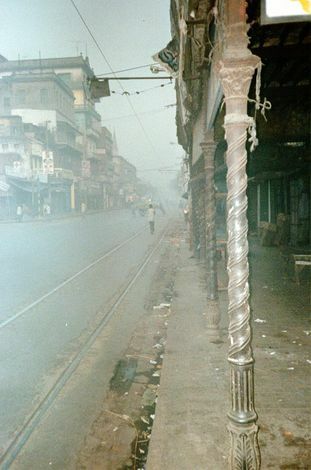 The last picture was taken about 1990; this one was snapped fast in 2004. It's a long way from 1903, when a ball marked the centennial anniversary of the building's completion. 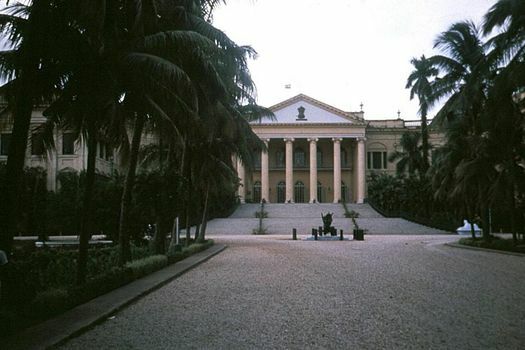 A century earlier, in 1803, a "most splendid entertainment" had marked the formal opening of the building, and in 1802 the governor general had staged breakfast for "above seven hundred of the principal ladies and gentlemen of the settlement.... On this occasion the great apartments of the new Government House were opened for the First time." 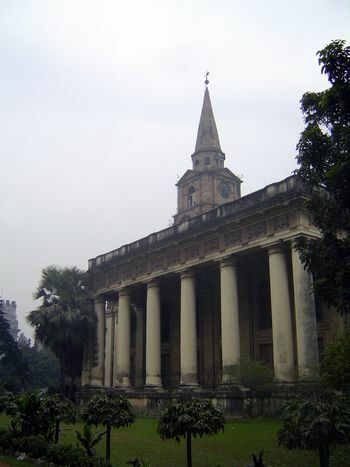 A block away: St John's Church, originally Calcutta's cathedral church. 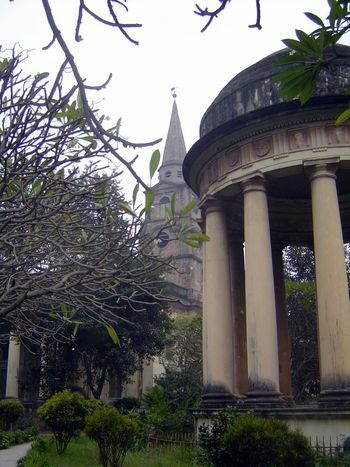 It was built in the 1780s to commemorate the victims of the First Afghan War. The plan was adapted from London's St. Martin-in-the-Fields, but the spire was shortened to minimize weight on the soft ground. On one side of the church is this monument to Emily Canning, wife of "Clemency" Canning, who wasn't sufficiently punitive, it seems, in dealing with the mutineers of 1857. Emily Canning's grave is actually in Barrackpore, upriver a dozen miles. Hard to read, but a fine specimen of funerary eloquence. The text is this: "Honours and praises/ Written on a tomb are at best/ A vain glory, but that her charity,/ Humility, meekness, [and] watchful faith in/ Her Saviour, will, for that/ Saviour's sake,/ Be accepted of God, and be to her a Glory/ Everlasting, is the firm trust of those/ Who knew her best/ and most dearly/ Loved her in life, and who cherish/ The memory of her departed.---The above words were written/ November 22nd, 1861, by/ EARL CANNING,/ Who survived his wife but 7 months./ He left India on the 18th of March,/ Died in London on the 17th of June,/ And was buried in Westminster Abbey/ On the 21st of June, 1862." Marian Fowler's Below the Peacock Fan: First Ladies of the Raj (1987) suggests that it was only in death that Canning paid much attention to his austerely Christian wife. 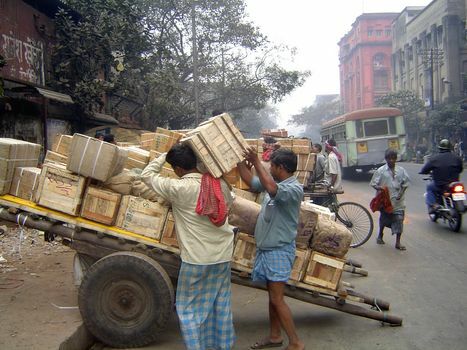 While still in London, Canning had kept a mistress; in India, work became his master. Childless, his wife decorated, painted, and went to church until dysentery finally killed her. 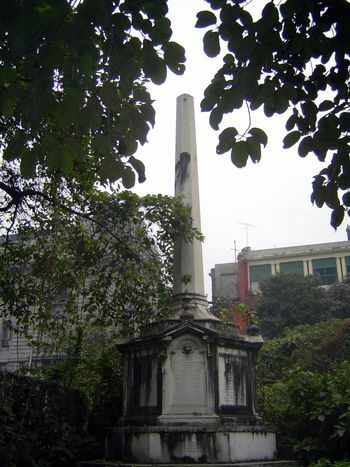 In a corner of St. John's, this monument was erected by a survivor of the Black Hole of Calcutta. 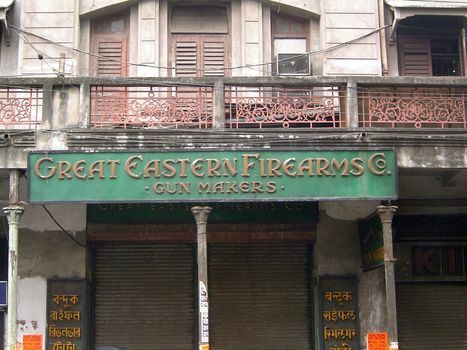 The story in brief: British traders--their leader, Job Charnock--settled in Calcutta in 1690. 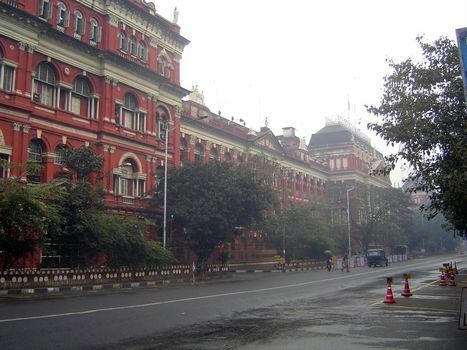 In 1707, when Calcutta had a population of 10,000, Bengal was made into a presidency separate from Madras. 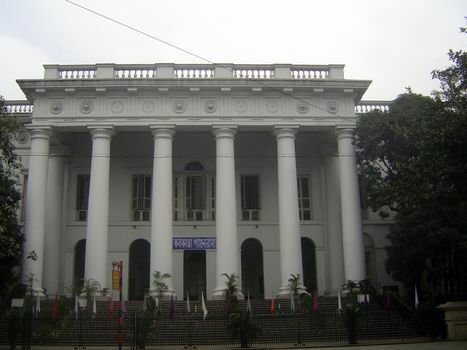 As such, it prospered until 1756, when the Nawab of Murshidabad attacked. Most of the British fled, but 146 who stayed were captured and on the night of June 20th, 1756, were locked in a room 16 feet by 18. All but 20 suffocated. 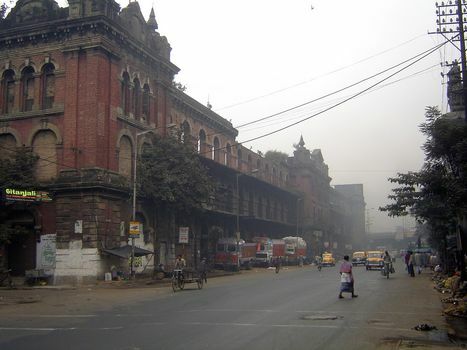 The British, under Clive, returned in 1757, retook Calcutta, and began the systematic conquest of Bengal. 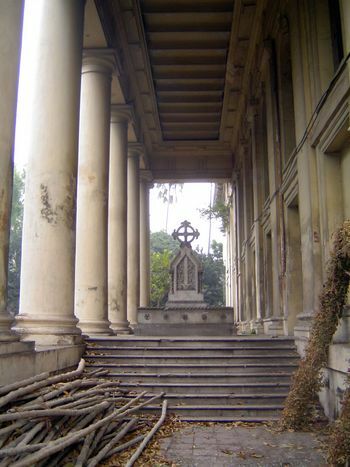 One of the survivors erected a monument on the site; it was renovated by Curzon in 1902 and moved here after 1947. 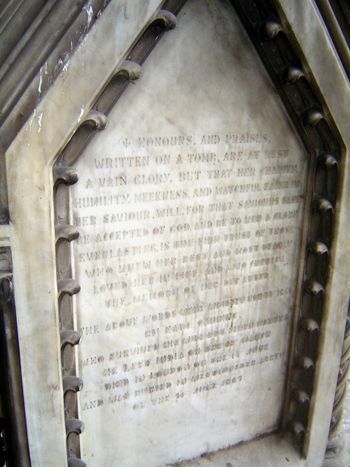 The inscription, from Curzon. 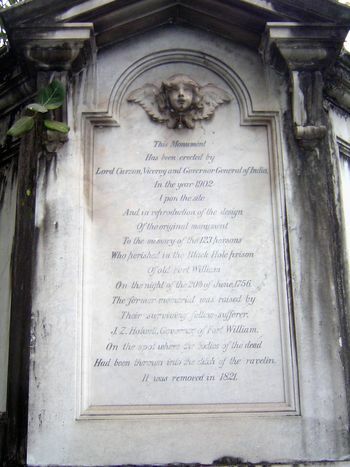 The original inscription listed the names of the victims and said that they "were, by the tyrannic violence of Siraju'd daulah 'uba of Bengal, suffocated in the Black Hole Prison of Fort William, in the night of the 20th day of June, 1756, and promiscuously thrown, the succeeding morning, into the ditch of the Ravelin of this place. This monument/ is erected by/ Their surviving Fellow-sufferer,/ J.Z. Holwell." 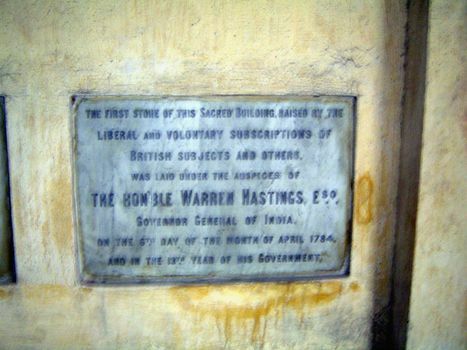 On the other side of the stone was this: "This horrid act of violence/ Was as amply/ As deservedly revenged on SIRAJU'D DAULAH,/ By His Majesty's Arms,/ Under the conduct of/ Vice-Admiral Watson and/ Colonel Clive,/ Anno 1757." Jump a mile upstream to the great Howra or Haora Bridge, with a 1,500-feet span (including the two cantilevered arms and the central suspended span). 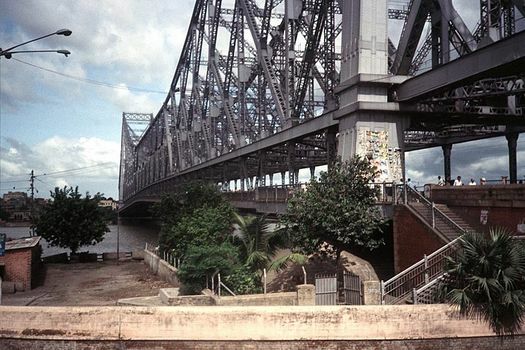 It opened in 1943 and replaced a pontoon bridge built in 1874 about 600 feet upstream. In 1992, a second bridge opened downstream two miles. 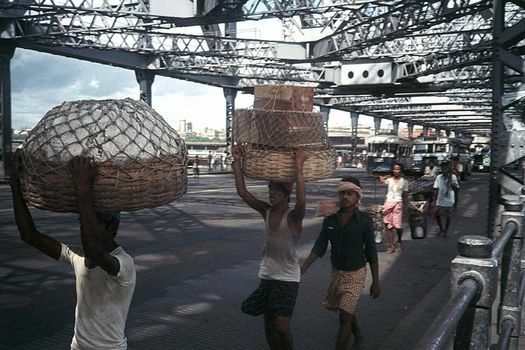 The Howra Bridge is a river in its own right: Two million people cross it daily, crowding the eight vehicular lanes. It also has broad sidewalks with a current of humanity straight from Kim. 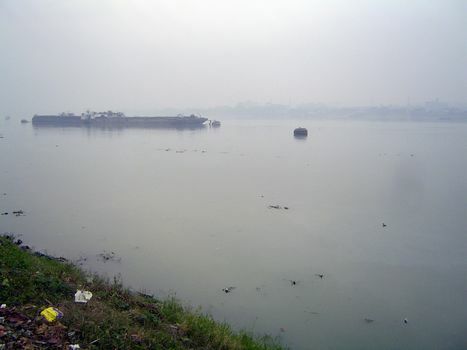 The view downstream from the city side of the bridge. The air is as murky as it looks; the water, more so. Murray's Guide from 1882 says that "the fleets of ships, the countless factories, pretty temples, numerous flights of stone steps down to the river, at which thousands of people, especially during the full moon, will be seen bathing, make up an interesting scene." We'll circle back downstream from the bridge. 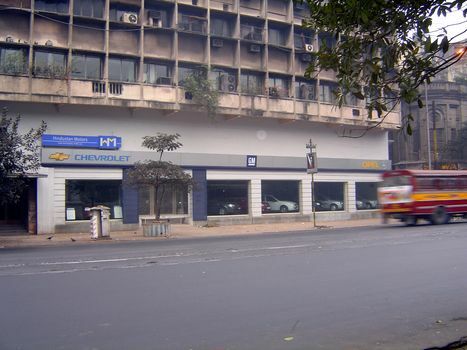 Some of the streets are lined with buildings that are obviously post-1947. 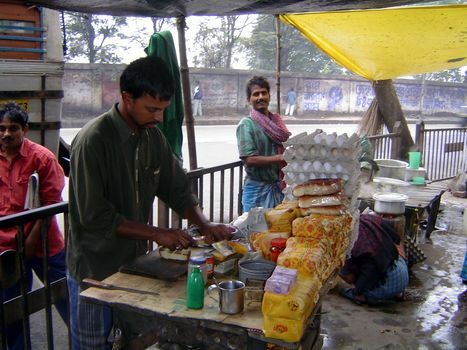 Calcutta isn't frozen. 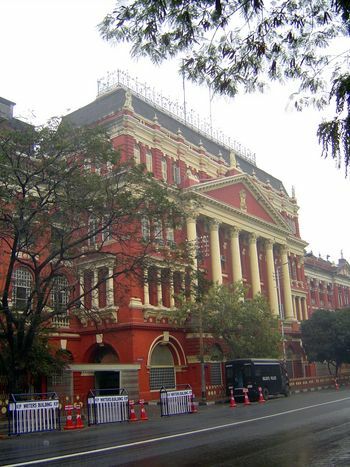 Of all the British-era buildings, however, the best known is the Bengal Secretariat, known from East India Company days as the Writers' Buildings. 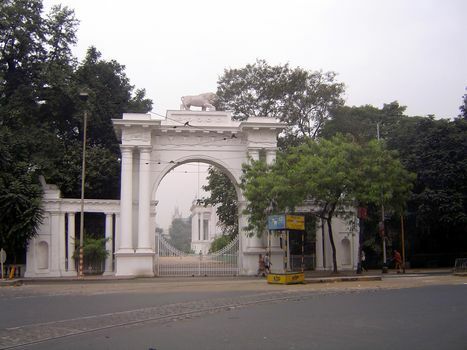 It faces Dalhousie Square, known now as BBD Bagh in honor of three Bengalis--Benoy, Badal, Dinesh--who in 1930 succeeded in killing Bengal's Inspector-General of Prisons. The building was designed by Colonel St. Clair Wilkins and completed in 1880, when it replaced an earlier structure from 1780. That older building is shown in a 1797 aquatint by the Daniells. Up top, a party celebrating Science. Other groups honor Agriculture, Commerce, and Justice. On the west side of the square is the post office, built in the 1860s to a design by Walter Granville. The Black Hole was here or nearby--the precise location is debated. 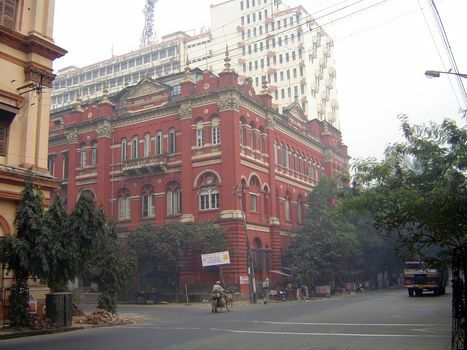 On the south side is the central telegraph office, 1876. 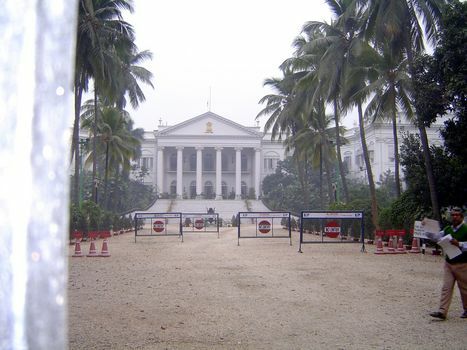 A block farther south was the viceroy's palace. A block closer to the river--and only a block from it--is an adaptation of the Cloth Hall at Ypres. 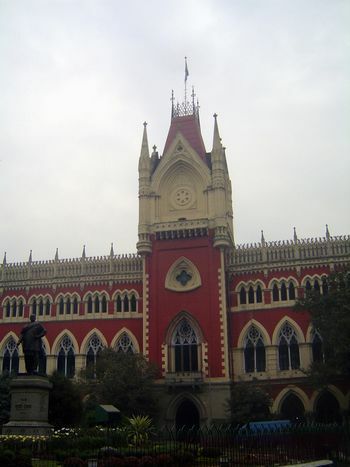 It's the High Court, 1872, designed by the same Walter Granville who designed the neoclassical post office. As with St. John's Church, the tower has been shortened to minimize the risk of subsidence. Thacker's Guide observes that the tower cannot "quite make up its mind whether it ought or ought not to have a clock" (p. 42). Flanking the viceroy's palace on the river side is the Town Hall, built at the start of the 19th century. 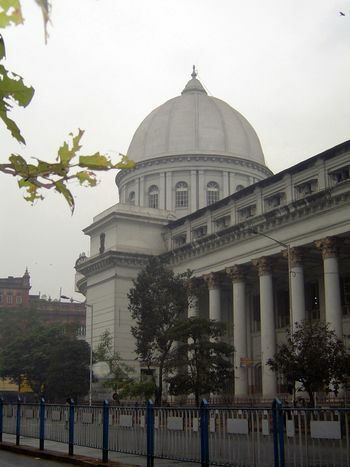 At one time it housed the Bengal Legislative Council. 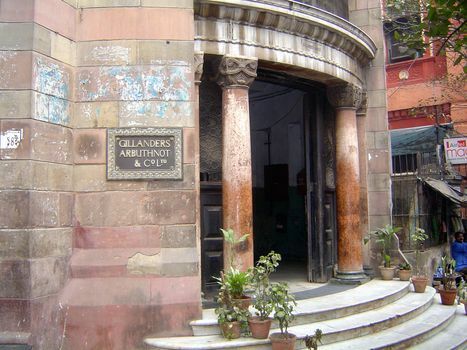 Lawyer's chambers. Still want to go to law school? 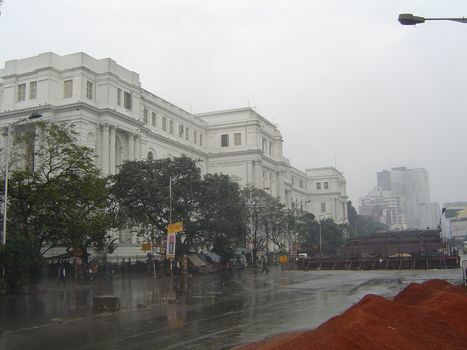 The riverside headquarters of the Calcutta port authority. 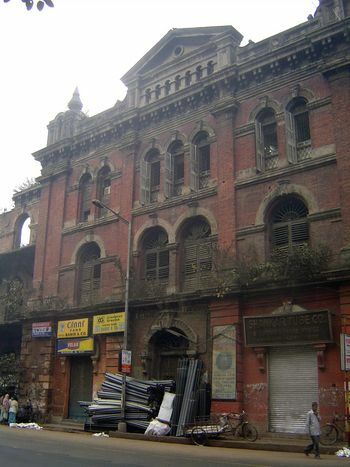 Upstream neighbor: the former headquarters of the East India Railway. Inside, the beams are worn-out rails. Farther upstream, the Strand Warehouse. 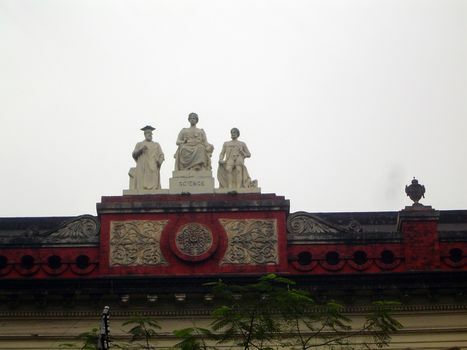 Detail of the warehouse facade. Think it's abandoned? 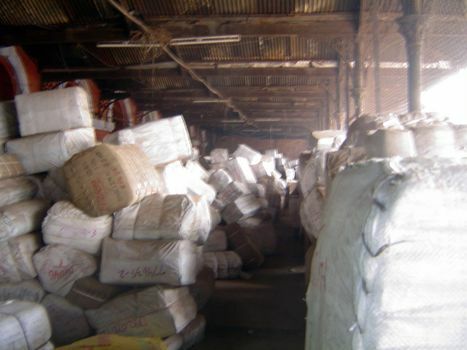 The river side of the same warehouse. 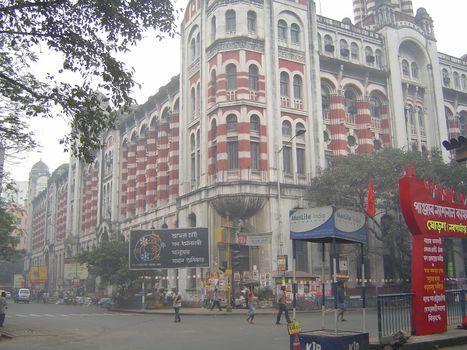 Inland a block, there's a lineup of handsome commercial buildings on what used to be Clive Street, now Netaji Subhas. 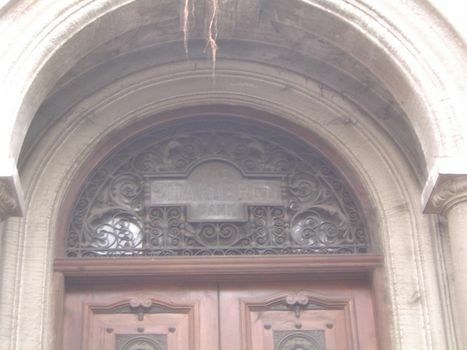 Entrance to the former Chartered Bank. A relic in surprisingly good shape on a surprisingly clear day. 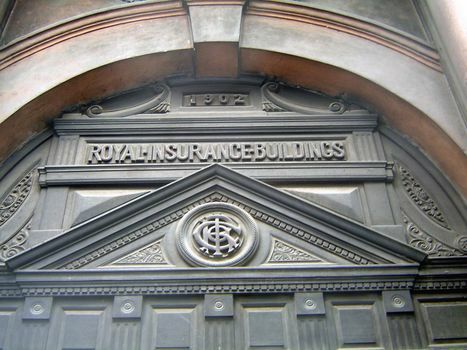 Another insurance company, now nationalized. 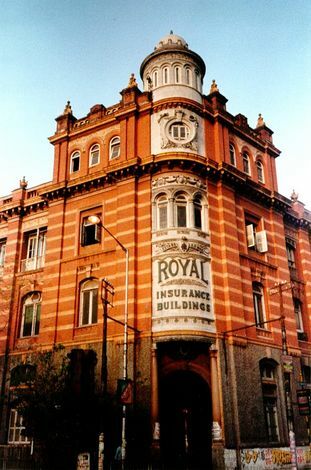 Offices of an old tea company. The firm, now Indian owned, goes back to 1819. 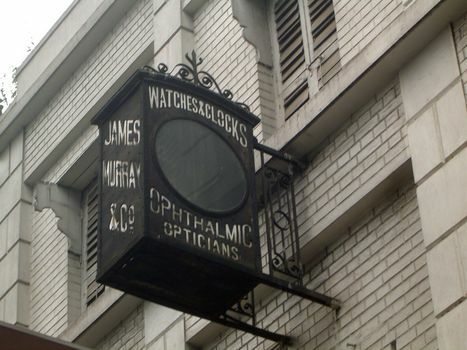 Old sign for a defunct business. 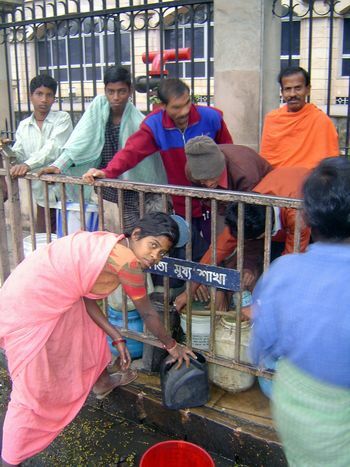 Water from a street tap. 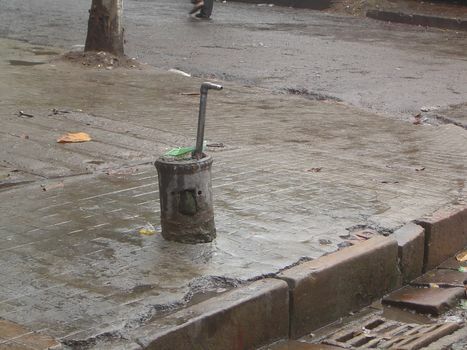 The kind of tap used. Crowding round for the morning wash. Tired? 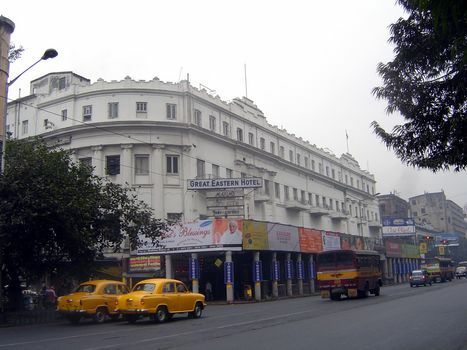 You can try this longstanding hotel, between BBD Bagh (Dalhousie Square) and Raj Bhavan (the viceroy's palace). 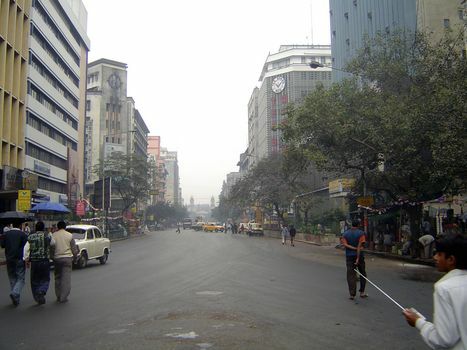 Or you can soldier on south to Chowringhee, once the "Broadway of Calcutta." 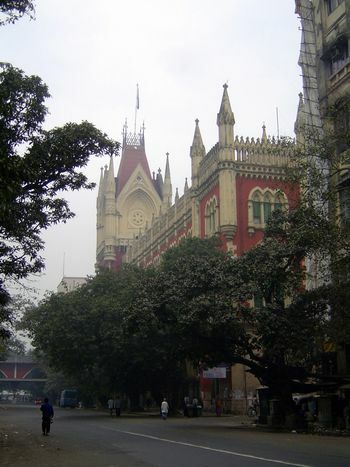 You'll pass this building, the famous Indian Museum, completed in 1875 to a design by Walter Granville--the same who designed the Gothic High Court and the domed Post Office. Look your last on the museum's 300-foot-long facade: a flyover has been built in front of the building. 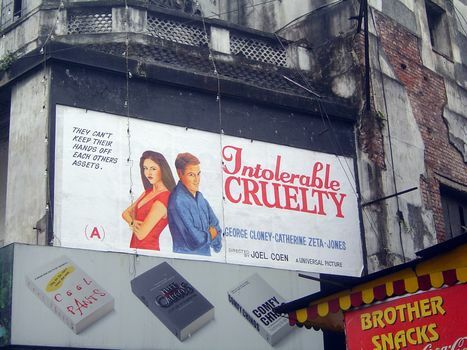 Here's why: it's Chowringhee a couple of hours later. May as well walk. Enough! We'll rest a bit before looking at other parts of the city.